← Would you pay to be in a Western? Happy 83rd Birthday to Actor, Horse Trainer and just all around Good Guy Alex Cord! Alex was Born Alexander Viespi in Floral Park, Long Island, New York. Alex has acted in several Western Movies including having the starring role of the Ringo Kid in the wonderful 1966 version of Stagecoach with Ann-Margret, Bing Crosby, Red Buttons, Mike Connors, Robert Cummings, Van Heflin, Slim Pickens, Stefanie Powers and Keenan Wynn (WOW WHAT A CAST!) and has guest starred in many Western TV show episodes. Something many people probably do not know about Alex is he was stricken with polio at the age of twelve. His family then moved to Wyoming where doctors advised him to take up horseback riding as a therapy for the polio. This helped him recover from the disease. His first film acting was in an episode of the western television series show Laramie in the episode titled (The Mountain Men) in 1961. He and Robert Fuller met on the set and became life long friends. CLICK ON THE PHOTO BELOW TO WATCH A WONDERFUL INTERVIEW WITH ALEX ON THE WESTERN TRAILS TV SHOW. Host Bob Terry and Special Guest Alex Cord on the Western Trails TV talk show. 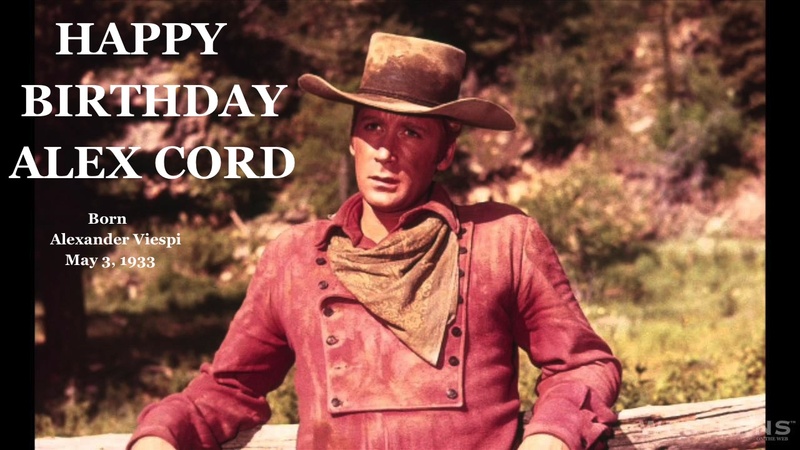 This entry was posted in Western Film Movie News and tagged Alex Cord, Birthday. Bookmark the permalink.